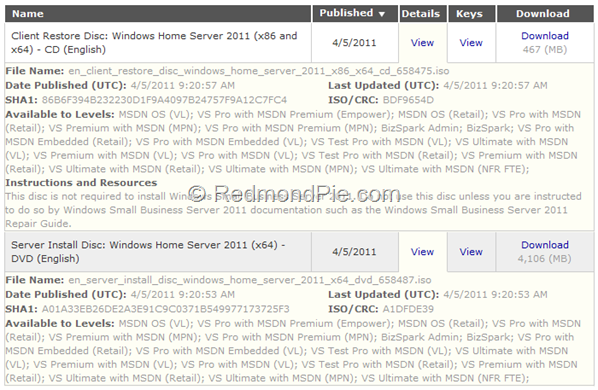 Microsoft has just released Windows Home Server 2011 to its MSDN and TechNet subscribers. Both TechNet Plus and MSDN subscribers can now evaluate Windows Home Server without any time limits what’s so ever. The two Windows Home Server discs – the Server Install Disc, and the Client Restore Disc can be downloaded from the subscribers download section of both TechNet and MSDN as illustrated from the screenshot below. What is Windows Home Server? Windows Home Server was designed for households and home-based businesses that have more than one personal computer. Your life has gone digital – it is time to simplify your life so you can easily access your files, photos, videos and music from any PC or TV in your home, or even while away from home. Why Windows Home Server 2011?